Stories by Stephanie Haines (WCAS15), Margaux Pepper (C14) and Danny Moran (J13). 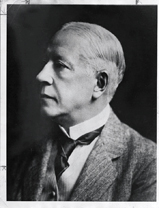 Charles Deering. Courtesy of Northwestern University Archives. The Deering family made its fortune in the farm equipment business and planted some of those profits at Northwestern. 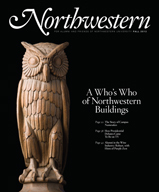 William Deering, founder of Deering Harvester Co. and president of Northwestern’s Board of Trustees from 1897 to 1906, funded the construction of Fisk Hall, designed by the firm of prominent Chicago architect Daniel Burnham. Charles Deering, his son, joined the family business and continued to support the University, often anonymously. By the mid-1920s the University had outgrown tiny Lunt Library, which had become overcrowded and inefficient as a book repository, and desperately needed a new facility. After Charles’ death in 1927 the family agreed that a library building would be a fitting tribute to his love for books. With contributions from Charles Deering’s widow and other family, the library fund surpassed $1 million. Charles Deering’s 12-year-old grandson, Roger McCormick, laid the cornerstone for Deering Library in January 1932. The lavishly detailed library opened in 1933, but within a few decades, Deering Library too became overcrowded. It served as Northwestern’s main library until University Library opened in 1970. During this past summer the University renovated the west-facing entrance to Deering Library, which had been closed for more than 40 years. It is scheduled to reopen this fall.